Jackson System Development (JSD) is a linear method of system development created by Michael A. Jackson and John Cameron in the 1980s. It comprises the whole software life cycle directly or providing a framework for more specialized techniques. JSD method lets describe and model the real world, not specifies and not structures the function performed by the system. The time-ordered world must be time-ordered itself, JSD depicts the progress in the real world that models it. The implementation of the system is based on transformation of specification into efficient set of processes. Modelling stage (analysis) - includes the entity/action step and entity structures step; on this stage is created a set of Entity Structure Diagrams (ESDs) and are identified the entities in the system, the actions, and the attributes of the actions and entities. Network stage (design) - contains the initial model step, function step, and system timing step; on this stage is developed a System Specification Diagram (SSD) or a Network Diagram which use rectangles to depict the processes and diamonds to represent their relationships. This stage defines the simulation of a real world, adds the executable operations and processes, and provides the synchronization among processes and introduces the constraints. Implementation stage (realization) consists of the implementation step which converts an abstract network model into a physical system and represents it as a System Implementation Diagram (SID). 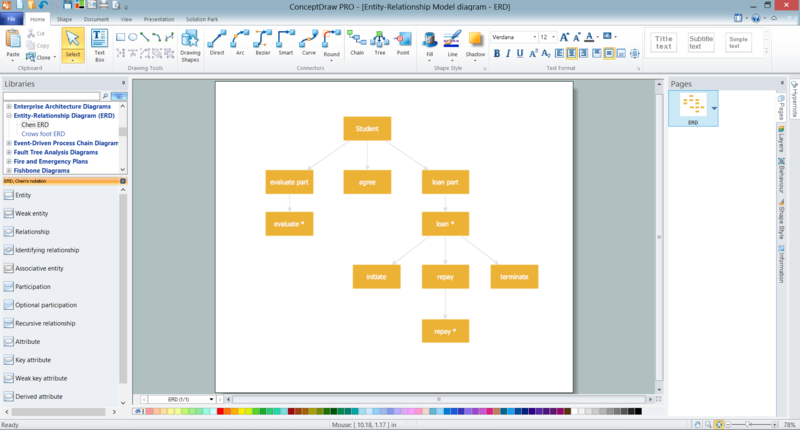 When implementing the Jackson System Development method and designing JSD diagrams, you can succesfully use the powerful and helpful tools of ConceptDraw DIAGRAM software extended with Entity-Relationship Diagram (ERD) solution from the Software Development area of ConceptDraw Solution Park. with numerous collection of ready-to-use vector objects for designing diagrams in minutes. This sample was created in ConceptDraw DIAGRAM diagramming and vector drawing software using the Entity-Relationship Diagram (ERD) solution from the Software Development area of ConceptDraw Solution Park and shows the Jackson system development (JSD). Use the predesigned objects, templates and samples of the Entity-Relationship Diagram (ERD) solution for ConceptDraw DIAGRAM to create your own professional ERD and JSD diagrams quick and easy.